Salak Phet, Chek Bae and Long Beach resorts, bungalows and guesthouses are very limited in scope, so do not expect the same range of options as over on the west coast. Whilst there are plenty of homestays targeted at Thai weekenders, these are not suitable for the more conventional tourist, so your choice comes down to one solitary luxury resort, Parama Resort and its sister boutique resort Parama 2, alongside a couple of 2/3 star resorts such as The Mangrove Hideaway and Salak Phet Resort. You will also find some nice guesthouses here and there around Salak Phet Bay, while for backpackers looking to escape the crowds, Treehouse Bungalows on Long Beach is the main attraction. If wanting to stay here, do bear in mind that the two beaches at Long Beach and Wai Chek are not in any way readily accessible, nightlife is non-existent and the few restaurants around, close early. Unfortunately, public taxis too only run three times daily back and forth from the ferries, so without your own transport, getting about can be both an organisational headache and very expensive. What the area does offer, however, is authentic and local Koh Chang life, tons of peace and quiet and some wonderful scenery. With all this in mind, therefore, here is our round-up of the resorts, bungalows and guesthouses in Salak Phet, Chek Bae and Long Beach. On the whole, accommodation in Salak Phet consists of Thai homestays, but scattered about, you will find some a few surprises tucked away. The Mangrove Hideaway, nestling by the water in the village, is a previously well reviewed small boutique hotel with rooms from 1,500bt to 1,800bt, but please note this has now changed hands from its original French owners. In the heart of the fishing community, the tiny 600bt a night guesthouse, Baan Yemaya, sits at the end of a wooden walkway amongst the stilted houses. Sleepover Hostel, same owners and just down the road from the temple, is now open with a couple of dorms and rooms sleeping up to 16 persons, beds are from 300bt a night. Aimed at Thai packages, Koh Chang Marina, home to the yachts of Gulf Charters, has bungalows and a small pool, but only really gets busy in Thai holidays. Picasjo House, a real curiosity next door, has accommodation from 1,200bt and is worth a look. Salak Phet Seafood is situated at the very far end of the bay, a mixture of simple a/c rooms at 1,600bt for a double or more elaborate cabanas over the water at up to 4,000bt. Island View Resort is a German owned, older resort down the track at the end of the bay, rooms on the water at around 1,000bt, more expensive on the hill – mixed reviews. It is also used as the base for Sailing Koh Chang. Years back, a never completed road was constructed with the intention of linking up Salak Phet and Bang Bao on the west coast. It has deteriorated enormously over the years but it does give access to the remote and undeveloped Wai Chek Beach and here you will find the occasional Crusoe type pitching a tent – all bungalow operations previously opened there have now closed. With its restaurant terrace backing onto the inland klong, small boutique two storey resort with rooms and suites, lots of teak floors and wooden furniture. Kayaks and boat trips. Changed hands from original French owners. Sea view or deluxe rooms and cabins, a/c and ensuite, built out over the water. Large island renown seafood restaurant, boat trips and popular with Thai packages. Over the water at the end of a small walkway lined with local houses. Small stylish guesthouse of just two a/c rooms with bathroom and a restaurant/cafe and terrace area. Food sometimes available. 6 nicely designed rooms with a tiny pier overlooking the bay in this artist’s home. Gallery, small coffee shop, breakfast available. Free kayaks. best with your own motorbike to explore and get to the other restaurants. A peaceful spot. Chek Bae is located over on the other side of the bay. Home to a handful of older resorts that cater to the Thai weekenders at Rommai Chailay, Ban Mae Resort and Karang Bay View, it is also, in stark contrast, the location for Parama Resort. Parama Resort, which sits about midway, is an upmarket getaway of luxury rooms, spa, ocean-front restaurant and swimming pool. Standard doubles start at 6,000bt but prices go right up to 17,500bt for the top floor suites with the best views. Parama 2 is just up the road, a cheaper boutique version with rooms from 2,500bt a night upwards. You can kayak in the bay, but no one takes a dip, so for a beach, guests are ferried across to the tiny strip of sand on the island in the middle, Koh Si Khao or offered the little strand at Karang Bay View at the very end of the road. Also towards the far end, Journey’s End is an tiny English run homestay at 500bt a night down by the ocean and just beyond it, you will find the long stay bungalows of Baan Vitee Thai, priced per night at 1,200bt, but with rent negotiable for weekly or monthly stays. Further rooms and a house rental are also available at sea facing Baan SuanNgaChang back towards the central section. Luxury resort by the water, with just 18 superior and deluxe rooms or suites. Lots of high end wood finishes, swimming pool, vast fish ponds, spa, shuttle boat to the beach on Koh Sai Khao in Salak Phet bay. Restaurant with daily changing menu, wine and spirit selection. All activities can be organised, luxurious but remote. Boutique resort adjunct to Parama, collection of nicely appointed, nautically styled rooms around a small swimming pool. Restaurant, pier, use of main resort facilities. All activities can be organised. Off the Chek Bae road that skirts the bay, a newly repaired and repaved road takes you far far down to the south east corner of Koh Chang and Long Beach. Like Wai Chek Beach, this is a remote, wild spot but it does have backpacker accommodation in the shape of Treehouse Bungalows. Rooms are cheap, 250bt to 350bt, but if you do stay here, there are no shops whatsoever, so you are very cut-off. Electricity is likely to be connected in 2018-19. Day-trippers from the west side head here during the day, though safe to say, it is far further than they envisaged when setting off, a 100km round trip of coming from down the west coast at Lonely Beach. Tantawan Resort, which sits beyond Long Beach overlooking Koh Ngam is also now open to allcomers, but only with a minimum of 2 rooms booked and has no wifi, not even with your mobile provider. Rudimentary old style Thai beach bungalows, all thatch and wood, arranged in rows up the hillside, shared bathroom, restaurant, cable wifi, generator electricity for 6 hours a night. It’s fun and backpacker but remember you will be with just those staying there for company. No shops. Here are a selection of other resorts and guesthouses. New hostel on a small side street just down from the temple, 2 male and female dorms, 4 beds each. Hot showers in the rooms. No Restaurant. Next door to The Mangrove Hideaway, old resort in the village, a/c double and family rooms. Thai packages and weekenders. Practical a/c bungalows, motel style building and restaurant on one side of the road, with the marina and small swimming pool on the other. Never busy. German owned older resort with 9 a/c rooms at the end of a wooden jetty, with restaurant or apartments on the hillside next to the swimming pool. 18 a/c bungalows set around a lagoon or on the sea front. Kayaks, boat trips, restaurant but no beach, popular with weekenders. English run homestay with 6 small fan and a/c rooms in a small garden setting by the sea. Bar in converted bar, breakfast. Boat tours with Fin’s Trip, their own boat. Friendly set-up, motor bikes available. At the far end of the track, handful of share rooms popular with Thai packages. Restaurant, small beach. Wooden bungalows now removed. On the hill above the beach and accessed by following the road past the Treehouse. Never opened or finished but electrity due to be connected in 2018-19, so watch this space. 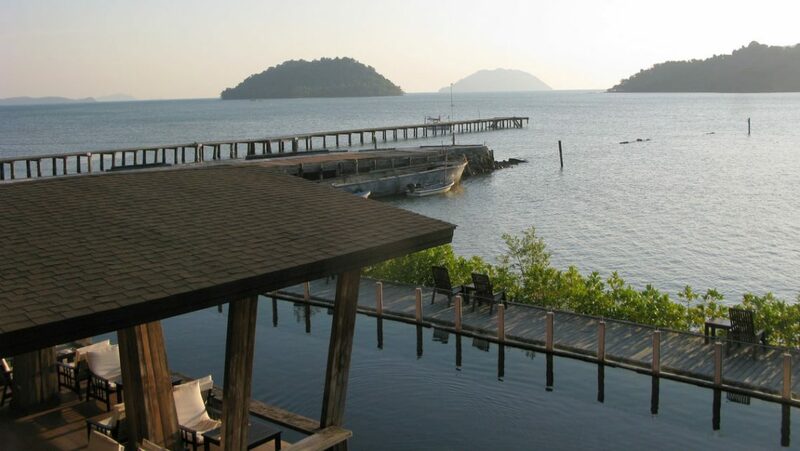 Small luxury resort tucked away behind Long Beach amongst the mangroves, with large bungalows on stilts overlooking Koh Ngam, the tiny offshore island. Restaurant. Very remote. Often closed. No wifi. Minimum 2 rooms.